Between work, family, friends and community, you’re constantly asked to be different things to different people. Shouldn’t more things work double-duty, too? If you’re stuck with one-size-fits-all home decor, take a look at these 10 great products that pack twice the punch, just like you do. When counter space is tight, a three-tier tray may be just the solution. Not only do these trays provide easily accessible storage, but they also increase surface area. Use them on the vanity to hold cosmetics, in the kitchen to hold your favorite seasonings, or even in the office to hold frequently used supplies. A tray like this bamboo server from Target is portable storage that moves wherever needed. After a long day at work, nothing says “welcome home” better than a comfy place to kick off your heels. This short-back storage bench from Juststoragebenches.com, is the perfect place to sit and unwind; plus, you’ll have added storage in which to keep your handbag, the kids’ backpacks and even your husband’s briefcase. With products like Renuzit’s Fresh Accents, you don’t need an electrical outlet to clear the air. These decorative fragrance options can be combined with your existing decor so you can enjoy your favorite scents in your favorite places throughout your home. Use them as paperweights in the office or bookends in the study. For an interesting touch, fill glass vases with Renuzit Crystal Elements. A well-placed mirror adds both style and function to any room. The strip mirrors from Umbra can be stacked together in various arrangements, adding a modern touch to any room. Use them in small spaces to reflect light, or near the doorway for a convenient spot to check your outfit before heading out to work. You don’t need to reinvent the wheel to find flexible storage solutions; just add wheels to your favorite storage products! 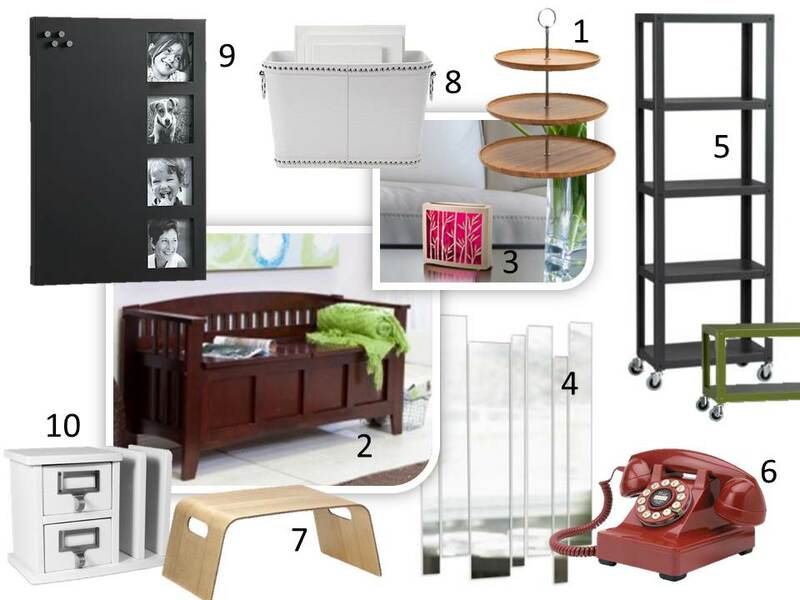 Go-cart bookcases from CB2.com take the legwork out of staying organized. Available in five-shelf and two-shelf sizes, they create a portable library that moves room to room. We have blinged-out covers for our cell phones, so there’s no reason the landline should be neglected. Try a vintage telephone in your favorite color to add a fun twist in your decor. This desk phone from homedecorators.com is the perfect piece for your stylish chit-chats. For the home office that’s home in bed, breakfast trays are a laptop’s best friend. Keep one like West Elm’s Bentwood breakfast tray near the bed for a quick and easy workspace to log some late-night hours. Who knows? You may even get breakfast in bed, too. Put one of these totes in the kitchen, foyer or family room to serve as a catchall for incoming mail. When it comes time to pay bills, simply move the tote to the office for sorting and archiving. The polished nailhead finish on the Marcella tote from Z Gallerie adds a decorative touch. Crate and Barrel’s chalkboard frame/memo board serves as a message center and picture frame. Write notes on the chalkboard, or use the magnets to hold important reminders — all while looking at the smiling faces of your favorite people. When little things in life start to add up, you need a place to put them. Portable drawers are an easy solution to tackle the clutter. Place them in the kitchen to hold frequently used items like batteries, take-out business cards or even your favorite recipes. Use them near the phone to hold notes or in the office to hold paperclips and pushpins. This letter holder from organize.com even includes a place to sort mail.